Superintendent Dr. James Wilcox gave board members an update on recent district progress during a regular meeting Sept. 17th. Dr. Wilcox informed the board that first Grade teachers at Ware East Texas Montessori Academy have spent a total of 8 weeks of summer in intensive training through Southwest Montessori Training Center and "will be completing their internship during the fall and spring of the 2018-2019 school year." "This marks the first step toward full implementation of the Montessori program from grades 1 through 5," he said. Enrollment has increased to 117 students, including 32 student and sibling transfers from within the district and 7 transfers from outside the district, Dr. Wilcox said. "A series of Parent Information Meetings were held throughout August during enrollment and registration to provide information about the program and assist parents with the registration process," he said. Dr. Wilcox explained that classrooms have undergone a transformation as Montessori materials have replaced traditional classroom teaching materials. "Most enrolled students are already familiar with Montessori routines and procedures since they attended the Montessori Prep Academy for Pre-K and Kindergarten which made for a smooth transition," he said. Dr. Wilcox also talked about the district's dual-language program at South Ward Elementary. "In addition to English learners, native English speakers benefit from participating in dual-language programs," he said. "Dual language programs appear to positively affect general academic performance and enhance job opportunities in the future." Starting in October 2018, South Ward Elementary School will begin offering the two-way dual language program to all students in first grade. A grade level will be added each school year. Instructional time will be 50 percent in English and 50 percent in Spanish. Wilcox told board members that all students will be partnered with a classmate who is dominant in the opposite language. "English Language Arts and math instruction will be taught in English, and Spanish Language Arts, science, and social studies will be taught in Spanish," he said. "At the end of five years, the students should be bilingual, biliterate, and bicultural." Dr. Wilcox also brought trustees up-to-date on the latest developments with the district's "OnRamps" initiative. "A dual-enrollment program, OnRamps enables high school students to experience the academic rigor of college and earn college credit at the University of Texas at Austin or Texas Tech University," he said. "The advanced courses are aligned to college content that transfer to any public university in Texas as core credits." Students are not required to take the TSI exam and have until the last day of class to claim credit for the course or drop the course without penalty. 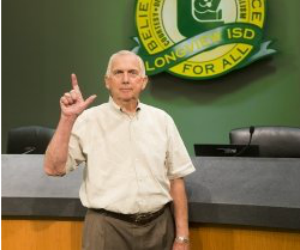 Wilcox told the board that Longview High School has joined with UT Austin to offer On Ramps dual enrollment to 227 students so far, with many more expected to join. "Students may enroll in a yearlong course in computer science, U.S. history, pre-calculus, and geoscience. UT-trained Longview High School teachers teach these courses," he added. Trustees meet in the boardroom of the LISD Education Support Center, 1301 E. Young St. The next regular meeting is tentatively scheduled for 7 p.m. Oct. 8th.